I made this card for Sherri's Jitterbuggin' Challenge - use pastels, use a cricut sentiment, add at least one button and follow the sketch. 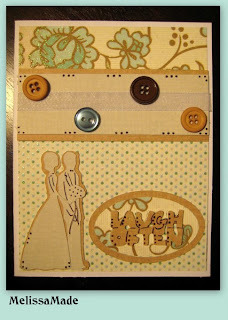 I just got this new paper from DCVW called the Linen Stack - I love it! So I had to use it. I needed something simple so this card is it. I've been a bit out of it for crafting lately - block, too tired, unmotivated - not sure, but I know from speaking with many crafters that it happens. My hubby and I have a beach vacation coming up and I think my mind is on that!!! Anyhow, I used the couple from Sweethearts cartridge and I used the sentiment from Beyond Birthdays. Something you should note, the Laugh Often from Beyond Birthdays didn't turn out so well. I'm not sure if it's the way the cricut cuts this image or if the blocky letters just don't look that great. But I touched it up a bit with some brown marker and now you can read it a bit better. I welded the shadow for the bride and groom on my Gypsy and then cut the regular image out separately. Then I pieced them together. I added some buttons and called it done. Quick and simple - just what my non crafting brain needed!!! Very cute card, Melissa. You are so talented. Very nice card....that new paper stack is wonderful! Thanks for Jitterbuggin'....and have a great trip! I like your card. It is adorable! TFS.